In order to send out your video email campaign, we create an email template that formats your text, images and video content into a professional and eye-catching design. We offer generic templates for quick email blasts and campaigns but our research shows that original designs will help you stand out from your competitors. We specialize in designing email templates that feature your product's branding, customize the template for your specific social media needs, optimize it for all email clients and test it 48 mail clients (mobile included). A landing page template or landing page is a single web page that appears after clicking on the email. Since many email clients still do not support video, we create a fallback image (where the video is loaded) and a "view in browser" link so your subscribers have the option of viewing the video email in a browser window. As an extension of the video email campaign, the landing page offers you an opportunity to further enhance the effectiveness of your campaign. By integrating this landing page into your website, the subscriber is led directly to your other products and services on your website after clicking on the email. If you decide to use the one-page (stand-alone) option, you can lead your subscriber to sign-up forms that will build up your mailing list and even have extra social media options, further call-outs and product/service offers and promotions. 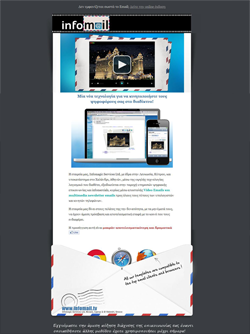 Check out some of our video email templates on our portfolio page. Click the button "View Email"
Our mission is to serve our clients though alternative channels using advanced technology. We aim to provide the latest in technological resources for use in digital communication. We hope to serve the needs of our clients and strive for the creation of a improved environment and community while promoting culture and prosperity. Please contact us with any inquiry.